Busy? Yes, you could say that. Hinckley Stuart is at capacity for summer storage and General Manager Brian Donnelly and crew have their hands full with a yard full of diverse yachts from government vessels to classics. The scope of summer work also includes adding the latest technology to keep Hinckley owners on the cutting edge of the yachting world. The boats here range from large to larger. Yachts undergoing general service include a 64’ Weaver sportfish and 78’ Marlow motor yacht, while a 74’ sportfish and a 85’ Sunseeker are in the paint shop. The Hinckley crew is also replacing a nine square foot hull section of a 100’ Broward and updating a 110’ Hatteras’ interior. One of our standout paint jobs this season will be Aphrodite. This boat, built by the Purdy Boat Company on Long Island in 1937, has a storied past. 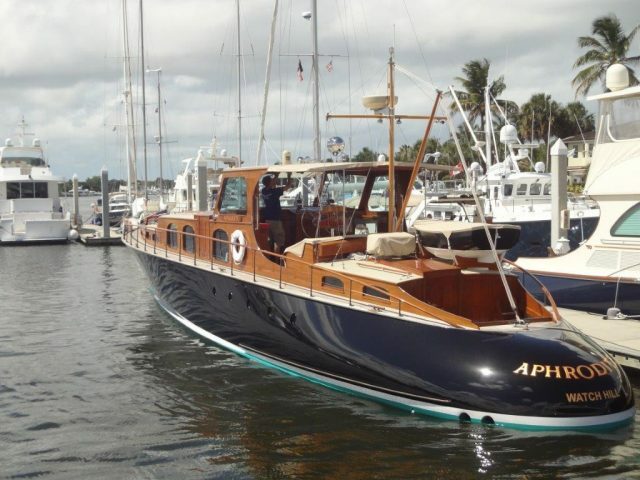 Originally a “commuter boat” to take owner “Jock” Whitney from his Manhattan office to his Fisher’s Island summer home, Aphrodite has wowed onlookers for nearly eighty years. We’re happy to be the latest in a long line of caretakers of this magnificent yacht. 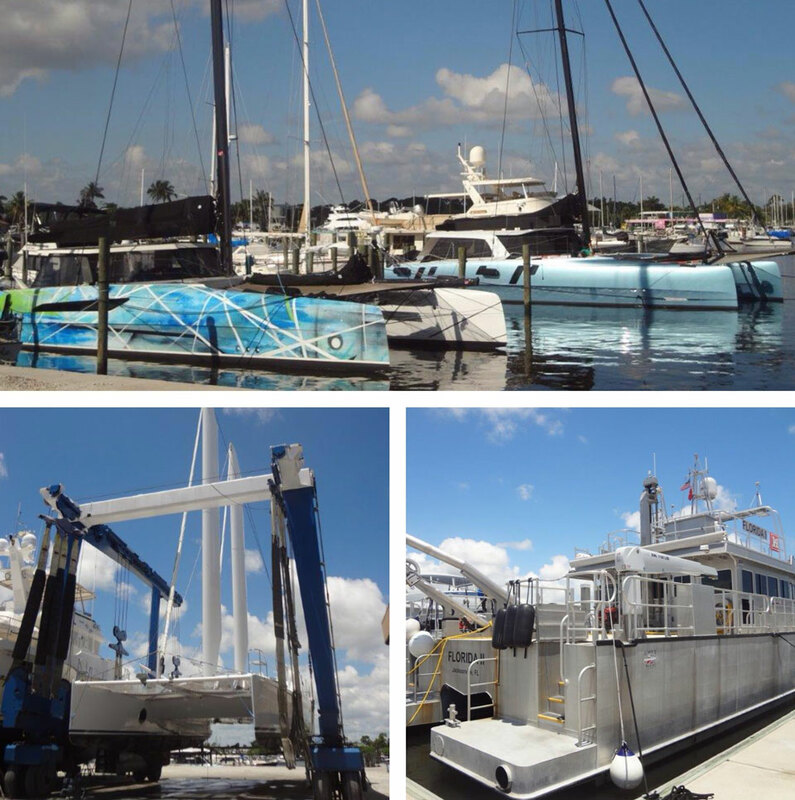 Summering in Stuart alongside Aphrodite are several catamarans, including the US Army Corp of Engineers survey vessel, USACE Florida II. The aluminum cat, propelled by Hamilton Waterjets, the same waterjet manufacturer used in Hinckley jetboats, comes to our Stuart yard regularly for service. Other multihulls include the futuristic-looking, Chris White-designed winged cat, and an impressive pair of Gunboats clocking in at 55’ and 60’. In terms of luxury sailboats, check out the Oyster Yachts in the yard. We are proud to be Oyster’s preferred service facility in the region, as well as for Gunboat, Ocean Alexander, Horizon, the Ferretti Group, and Hylas Yachts. One sweet piece of technology being added is Seakeeper, which helps diminish the roll, pitch, and sway while operating in choppy seas. Seakeeper is a computer- controlled gyroscope that eliminates most boat roll, and the fatigue, anxiety and seasickness that goes with it. Hinckley Stuart is an authorized installer. This season, come say hi to Brian, Scott, Dave and all the crew, but don’t stay too long…we’ve got work to do.